01 May 2018 - 14 May 2018 Srujanavani Skill Development Centre, Veeravilli Agaraharam, V.Madugula and Svln Zph school, Gopalapatnam, Visakhapatnam. With an objective of bringing out the creative side of children by engaging them through hands-on-activity, was planned at our campuses at SVLN ZPH School Gopalpatnam and Skill Development Centre Campus at Vaddadi for rural students. 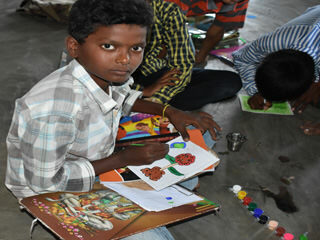 Multi-faceted co-curricular activities were planned for the children to immerse themselves in the joy of learning. The camp spanned for a 15 day period at both the centres. 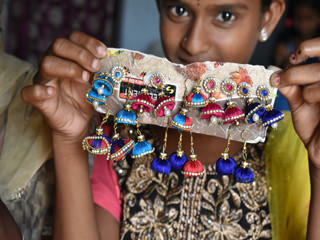 Art of paper quilling, preparation of low budget gift materials with household waste, Origami, Activities related to team-building, meditation classes, kolatam dances, and computer basics were some of the activities that were introduced to the children. Besides, motivational videos and inspirational films were also played for the children to infuse patriotic spirit. Handwriting classes and Storytelling sessions stand as special feature of this 15 day period. Nearly 80 students have participated in the summer camp at our centres and their exuberance and enthusiasm is reflected in their work and display.